This series could clearly go on and on, but you have to draw a line somewhere. So the official registration of Oliver's birth seems a good opportunity. 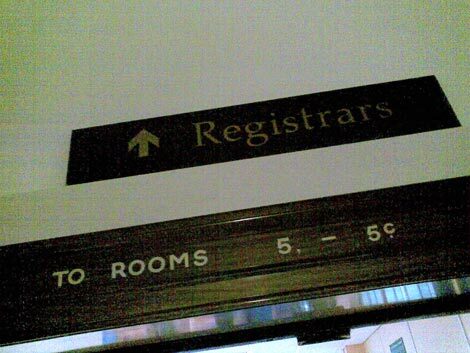 This can only be done with the official Registrar at Camden Town Hall. The latter is essentially another solid 1930s building at Judd Street, opposite the scaffolding-clad spires of St. Pancras station. The excellent Daddy Types covers new prams amidst numerous other objects it's OK for new dads to get distracted by, with detail, passion and, thankfully, good humour. The forthcoming release of the new Bugaboo stroller, the Bee, is anticipated with much the same fervour that the Second Coming might be. He has an interview with the Bugaboo boss, who speaks of his "desire to change the world, not just fill out a product line", with the Bee a product of "form integrated with function.". I appreciate that level of passion in a product. And so far, the Bugaboo is working well. For instance, for this first trip with Oliver, we step out into what the following day's news headlines would later describe as 'TWO MONTHS OF RAIN IN JUST ONE DAY'. It's an absolute monsoon for 20 minutes, far closer to a tropical summer storm in Brisbane that England's usual light persistent drizzle. But under the Bugaboo's rain cover, Oliver is completely dry. We're soaked, but he sleeps right through it. 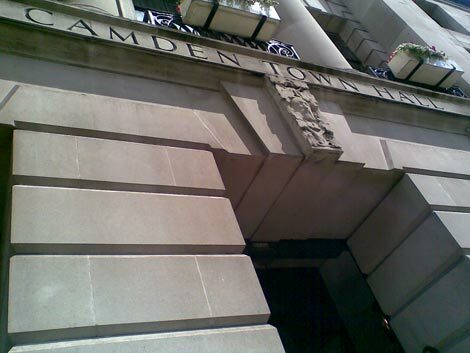 To Camden Town Hall, which doesn't quite have the grandeur of the great gothic town halls of a generation previous. The original layer is not a bad building - it's relatively distinguished, solid, but somewhat mundane. It does have some lovely interior touches typical of the era, such as those also seen earlier in the older layers of Elizabeth Garrett Anderson - doors, internal windows, door handles etc. Juhani Pallasmaa has said you can tell a lot about a city by looking at its door handles. In Helsinki, it's one of the first things you notice. Handles by Holl, Aalto and others, visible from the street. In London, all the best door handles are internal. Is London an internalised city? 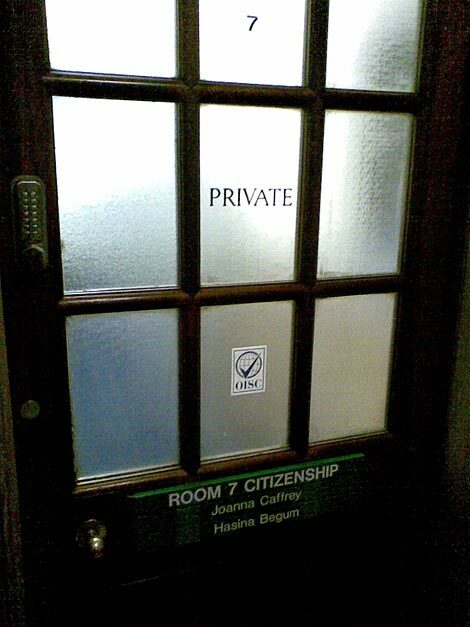 Inside here are some great old municipal touches - doors with Orwellian things like 'Room 7 - Citizenship' written on them. There's a delicious nostalgia in all these things, but this building isn't really of the quality to preserve; these touches are not enough to warrant it standing in the way of progress, and a more flexible, adventurous, contemporary building to represent Camden is probably required. Others have clearly thought so too, over the years, though with variable results. The Town Hall has been adapted, with a modern layer constructed along the Argyle Street and Euston Road sides. Again, quite typical of British town halls - see also Sheffield Town Hall, with its 1970s egg-box parasite attached to the side of the gothic host. This looks similar, but unlike Sheffield's doomed extension, is still standing. It continues to show its age inside with a haughty interior of white marble and grand staircases. The flow of this space is disrupted by a new desk in the foyer, but the functions of the town hall have changed somewhat since the staircase was envisaged. The space was still imposing enough to stand in for the US embassy in Moscow, for the execrable Val Kilmer vehicle 'The Saint'. It also features in 'Shadowlands' and 'Breaking and Entering', presumably playing itself. The role it's playing now is that of 'Registry Office suffering a computer breakdown', so all the paperwork has to be done by hand. The details of this episode are rather dry, the only thing that is today, and we're done within 30 minutes. Oliver officially exists. 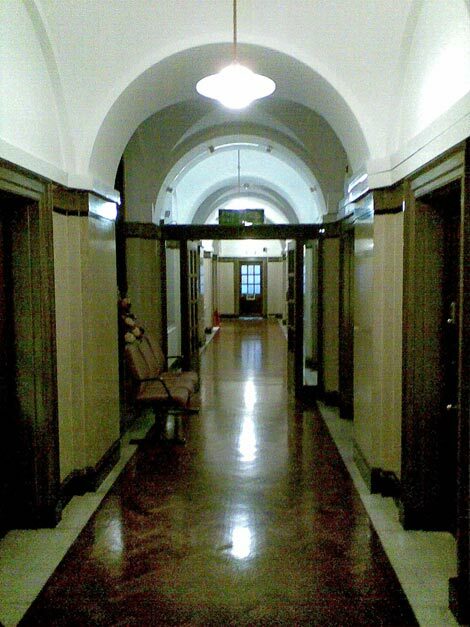 And we're out, back via the Brunswick Centre, through Senate House, to Gower Mews. And there I'll leave it. I felt the need to write something here, so collected the thoughts that felt most appropriate - how I saw some of the buildings, places and things involved in, or altered through, Oliver's birth. It's also a farewell to the area, an act of self-preparation for moving on to Australia. As such they are perhaps the most personal entries I've written here. And at the same time, it isn't the full story at all, and I'm certainly not suggesting it's Celia's story, nor is it Ollie's. They will have their own to tell, although Ollie's might be even more impressionistic than mine. Involving less brickwork too, I would imagine.